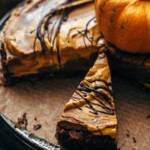 NO-BAKE Pumpkin Chocolate Pie! Easy no-bake graham cracker pecan chocolate crust & super creamy 8-ingredient no-bake pumpkin chocolate filling. Made in 20 minutes and so delicious. 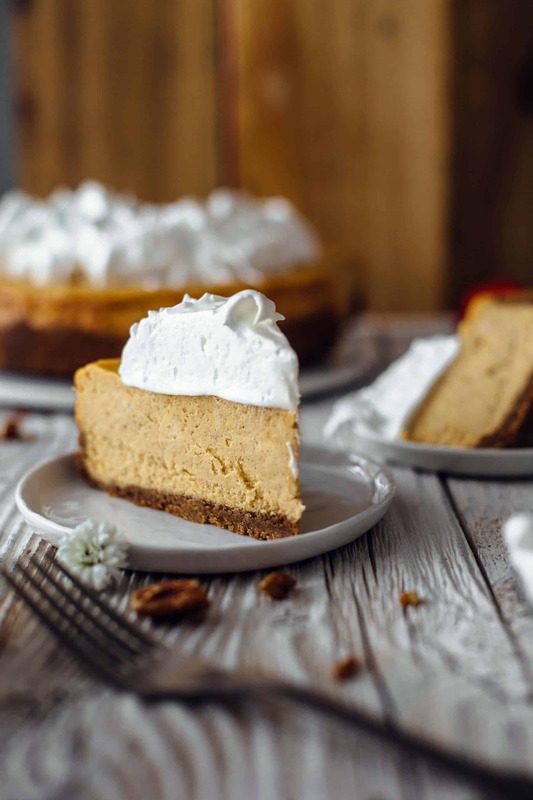 Today, I show you how to make a no-bake version of a pumpkin pie. But a pimped up version. 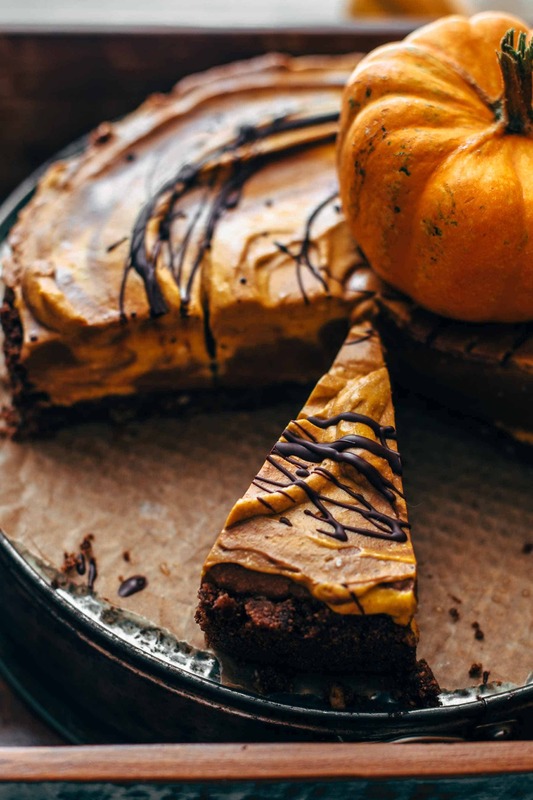 A No-bake Pumpkin CHOCOLATE Pie. I know it’s already fall and it’s not hot outside anymore, but hey, who says that we always want to turn on the oven when it’s cold outside? 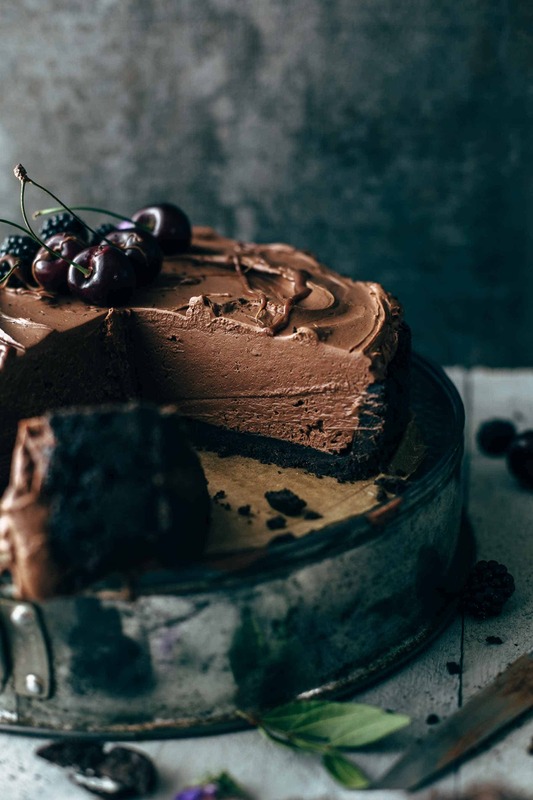 No-bake treats are in every season a hit, right? This, my friend, is a great no-bake fall dessert. It tastes intense like pumpkin and chocolate. And these two are always a great combination. I’m sure this also would be a great Halloween dessert. You probably would need a spooky finish. Like little skulls are something like this. Speaking of Halloween, I’m planning a super spooky cake to make. I’m sure you’re going to like it. So stay tuned. But now let’s jump into this recipe. We start with the crust. Well, this story is told in no time because it’s super easy to make and you don’t need to bake the crust. 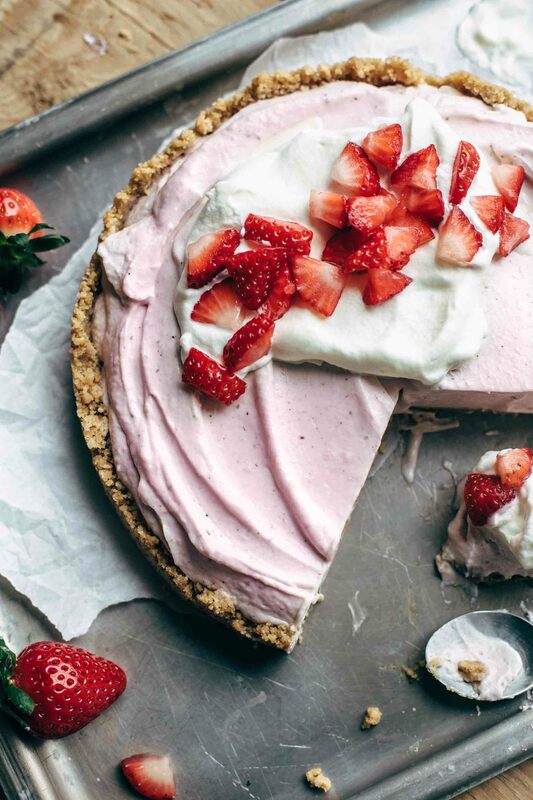 A super delicious no-bake pie crust. Yay. You need graham cracker crumbs, chopped pecan, sugar, cocoa, butter. That’s it. The result is great. I have to say that this is the best no-bake pie crust I’ve ever had. It’s crunchy, nutty, chocolatey, and a bit salty & sweet. Just stir everything together in a large bowl and press crumbs into the bottom and halfway up the sides of a springform pan. Use a flat-bottomed cup for best results. To get super fine graham cracker crumbs, I place the graham crackers in a food processor and pulse for about 20 seconds. If you don’t have a food processor, place the graham crackers in a zip lock bag and smash them with a rolling pin into little crumbs. This also takes you less than a minute. Then freeze until the filling is done, fill, and chill overnight or until firm. 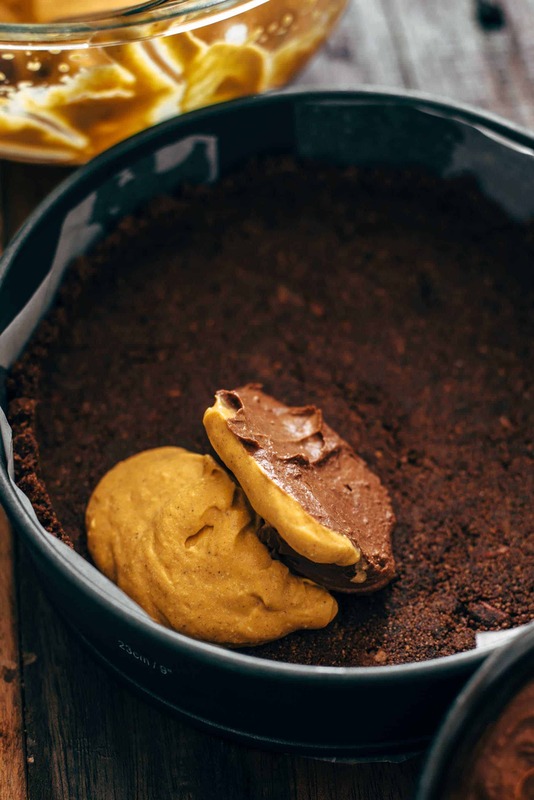 When the No-bake Pumpkin Chocolate Pie is ready to serve the pie crust will stick together without baking. A miracle! Actually not really. A butter miracle maybe. The butter holds the crust together. 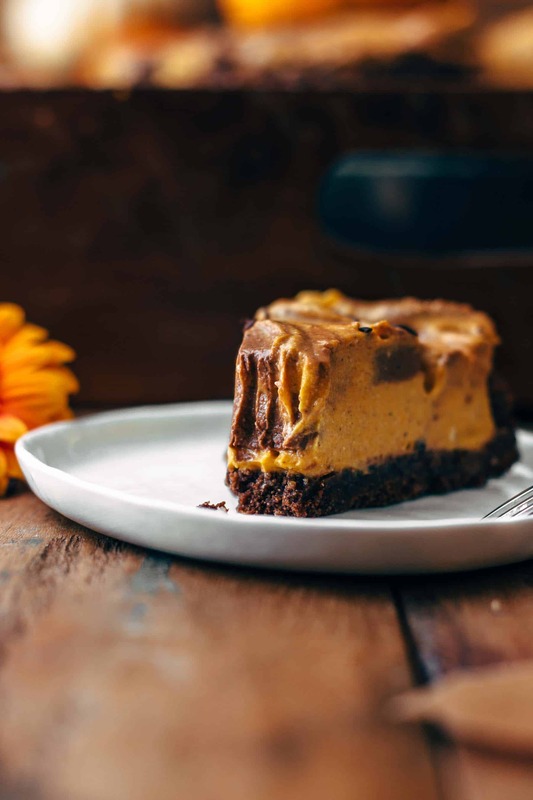 The filling is hard to describe because it is like a delicious mix of a pumpkin pie, a chocolate pie, and a no-bake cheesecake. Doesn’t that sound like the best mix ever? You need just 8 ingredients and it takes you a few minutes to make the filling. Mix cream cheese until creamy. Then mix in sugar. Followed by pumpkin puree, cinnamon, and vanilla. Then heavy cream. Divide batter into two bowls equally. Then add melted chocolate and cocoa to one of these two bowls and stir to combine. Then remove pie crust from the freezer and alternately spoon pumpkin and chocolate filling into the crust. Level with a spoon or an offset spatula. As you can see in the photos, my pie design is very rustic. It is up to you how you design your pie. The marbleization is also depending on how you spoon the two fillings into the crust. Ah yeah, before I forget it to mention, to get the filling light and creamy, I added 1 cup of heavy whipping cream. Oh yesss. Definitely not bikini friendly. But if you live in a country/state where you have about 45°F right now you won’t be in the mood for a bikini, right? Sweatpants are the clothes of choice. The bikini shape shall be the problem of your future you. Get ready for your sweatpants! Woohoo. Fall is already awesome! 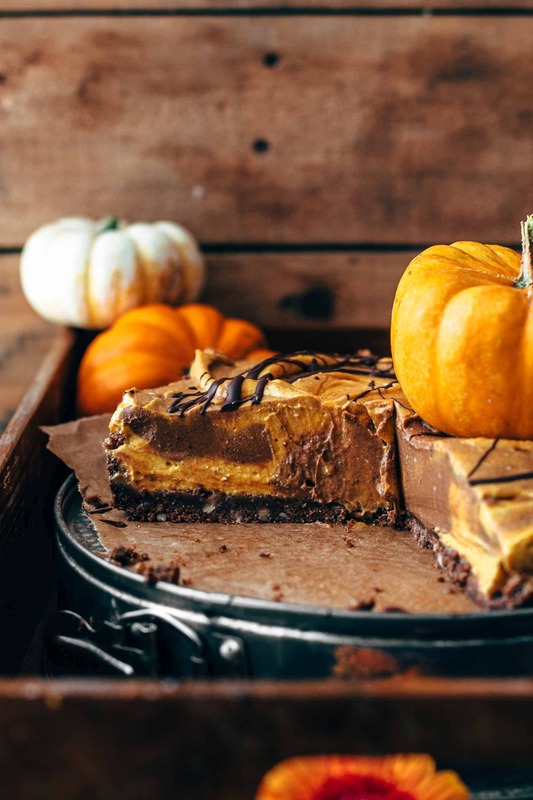 If you make this No-bake Pumpkin Chocolate Pie recipe leave a comment, rate it and tag a photo #alsothecrumbsplease on Instagram! Would love to see your snap! 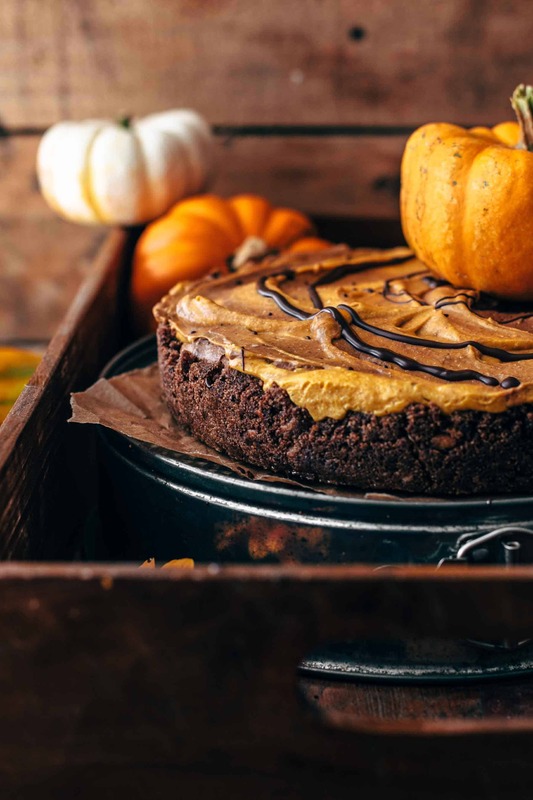 You may also like Marbled Pumpkin Cake with Maple Frosting, No-Bake Chocolate Cheesecake Recipe, No-Bake Strawberry Cream Cheese Pie Recipe, Sweet Potato Cheesecake with Marshmallow Meringue, or click here to see all recipes. Line the bottom and the sides of a 9" (23cm) springform pan with parchment paper. Set aside. 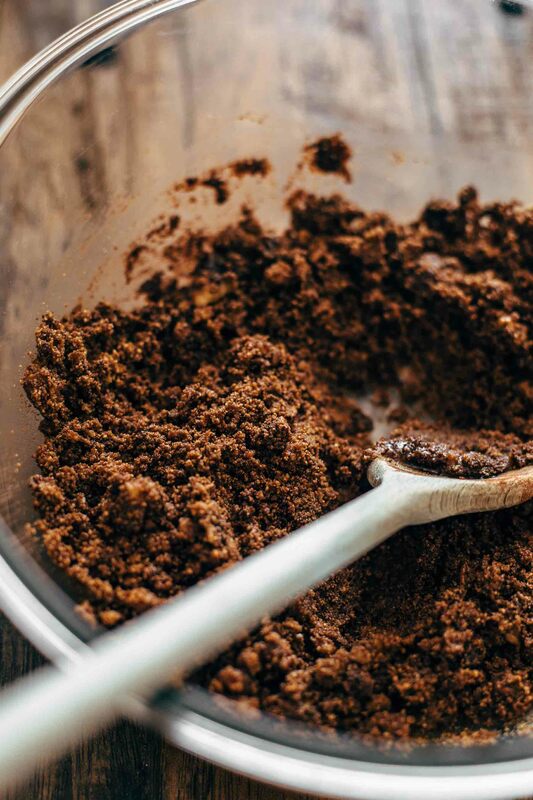 In a large mixing bowl, using a wooden spoon, stir graham cracker crumbs, pecan, cocoa, sugar, and butter until combined and evenly moist. 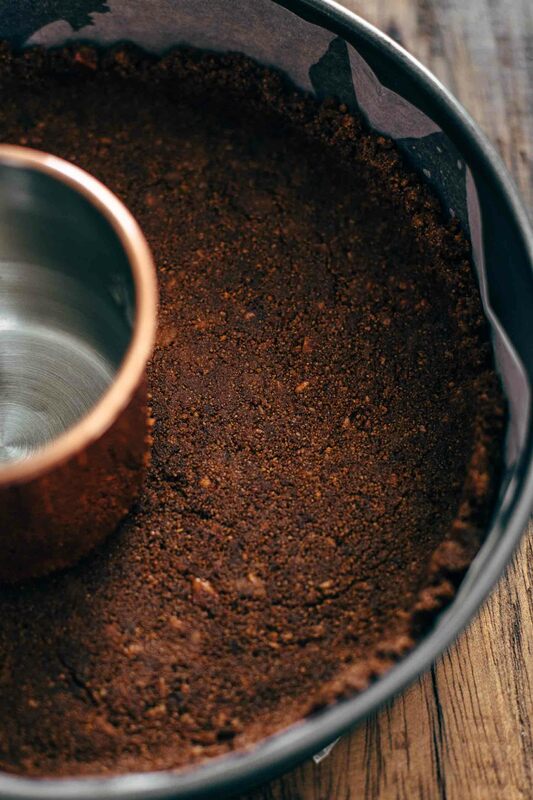 Transfer to the prepared pan and press crumbs into the bottom of the pan and about 1 inch high up the sides with the back of a flat-bottomed cup. Freeze until you are done with the filling. In a large mixing bowl, using a handheld or stand mixer fitted with a whisk or paddle attachment beat cream cheese on medium-high speed until soft. Add sugar and mix until combined. 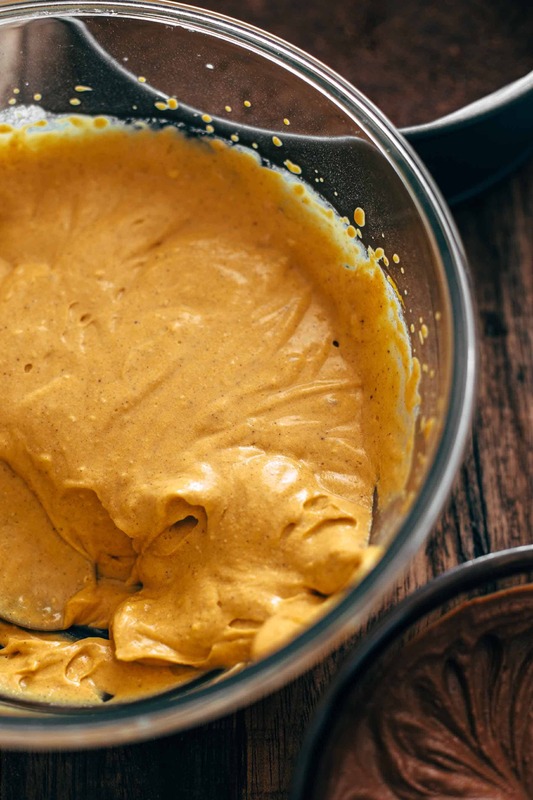 Mix in pumpkin puree, cinnamon, and vanilla* to combine. Add whipping cream and mix until creamy. Divide mixture into 2 bowls equally. Add melted cocoa and chocolate to one of the two bowls and mix to combine. Remove crust from the freezer and alternately spoon filling into the crust. Cover and let chill in the fridge overnight or until firm. Store leftovers covered in the refrigerator up to 3 days. Nach genau sowas hab ich gesucht. Kuchen der nicht gebacken werden muss ist wie für mich gemacht. Hah, this is lazy baker style, right? Perfect for lazy Sundays. Have a great day, Tamara! This recipe sounds really delicious. I’ll try it right now. Thanks! Julia, you’re gonna love it! 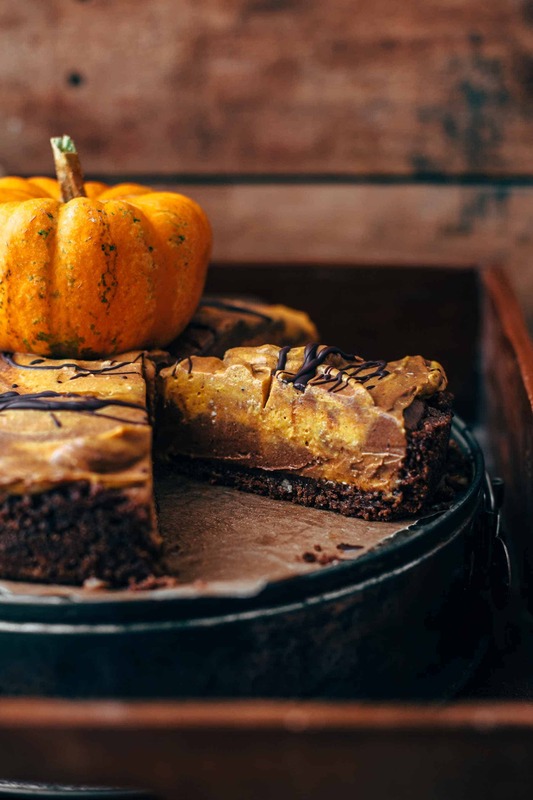 Pumpkin and chocolate are perfect for lazy Sundays. Have a great Sunday! Das sieht so unheimlich lecker aus, das Rezept muss ich unbedingt mal ausprobieren ? Besonders die Fotos sind unglaublich ? Thank you, Nicole! I hope you’ll enjoy it. Was für tolle Rezepte du hast. Wirklich ein gelungener Blog. Und diese Torte wird sicher von mir ausprobiert. Ich bin ein großer Fan der "Nicht-backen-Torten"
Thank you so much, Kerstin! I’m a big fan of no-bake recipes as well. The pie looks incredible and so easy! YUM! It is so easy! Thank you, Natalie.